I spent my first two years of yoga avoiding Warrior III. Then, I spent another year avoiding it. Finally, after avoiding it for an additional 15 years, I’ve made it a mainstay of my practice. What can I say? I guess it takes me a while to warm up to things that expose my weaknesses, knock me off balance, and frustrate my ego. I have to admit, I actually like it now. Part of the reason I avoided the pose was that I didn’t feel that I should struggle with it nearly as much as I was. The degree of difficultly that I experienced didn’t seem commensurate with the challenge of the pose. After all, standing postures like Utthita Hasta Padangusthasana, arm balances like Eka Pada Galavasana, and balancing in inversions like Forearm Balance and Handstand weren’t very difficult for me. But, three seconds into Warrior III and I would topple over. Now that I’m no longer avoiding the pose, I’ve figured out a few things that make it much more accessible and effective. Go figure, now that I’m not avoiding something, I’m actually learning about it—shocker. What incredible insights yoga teachers have, right? 1) Strongly rooting down through the base of the big toe. 2) Strongly adducting both thighs toward each other like I’m squeezing a block. 3) Engaging the spinal muscles and hamstrings (of the top leg) like I’m doing Locust Pose. 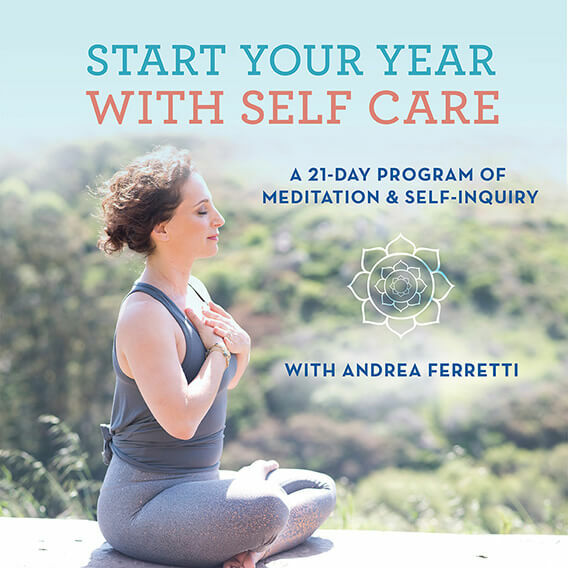 4) Firmly pressing my hands together in Anjali Mudra for a few breaths to help me feel the midline of my body before reaching my arms forward. 5) Holding my breath, thinking about the future, judging myself, and assigning blame to others. Here’s a quick sequence to help you build up to Warrior III. I’ve been enjoying this sequence quite a bit lately. Simple, straightforward reclined Hamstring and Adductor lengthening to prepare for the upcoming demands of Warrior III. Paripurna Navasana and Ardha Navasana pair perfectly to strengthen your core. Bringing your attention to your center early in this sequence will help you keep your attention focused on your midline when you get the wobbles in Warrior III later. These two poses help you transition from the reclined and seated postures to the upcoming standing postures. This is a progression of standing balances with the legs abducted and externally rotated. These postures will get you tuned in to standing balances and they’re typically easier than the upcoming standing balances. These three postures shift the orientation of the legs and hips into the same orientation as the upcoming Warrior III. Parsvottanasana gives you one more opportunity to prepare your hamstrings for Warrior III. Many teachers transition into Warrior III from Warrior I. I prefer transitioning into Warrior III from a high lunge. I think it makes more sense for the hips. Check it out and see what you think. 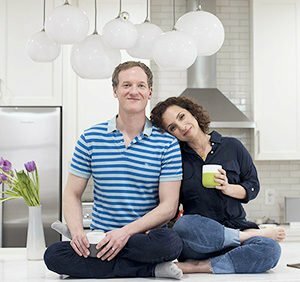 Want to practice this sequence at home? When you sign up for our newsletter we’ll send you a free printer-friendly PDF of the sequence! In my 500-hour Teacher-Training Programs I have my students compare Bakasana and Titthibhasana, or Firefly Pose, with the aim of learning how to create effective sequences for each of these postures. When the trainees look at the two poses side-by-side, they see something they usually haven’t noticed before: Bakasana and Tittibhasana (Firefly Pose) are nearly the exact same pose. However, the one major difference between the two postures has significant sequencing implications. We’ll get to the yoga sequencing implications in a moment. But first, let’s look at the similarities between the two poses. 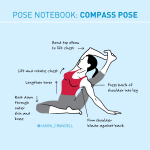 Take a moment to compare Bakasana and Tittibhasana (Firefly Pose) below. 1. Both poses flex the spine. 2. Both poses broaden the scapulae while strongly engaging the serratus anterior. 3. Both poses require strong core engagement, most significantly the transverse abdominus, the rectus abdominus, and the illio-psoas. 4. The shoulder joint (or gleno-humeral joint for you fact-checkers out there) is at approximately 90 degrees of flexion in both poses. 5. Both poses strongly flex the hip joints and require the adductors (inner thigh muscles) to engage to prevent the legs from sliding down the arms. In simple terms, the arms, shoulders, shoulder blades, spine, core, and hips are doing the same thing in Bakasana and Tittibhasana. The one significant difference between the two poses is that the legs are bent in Bakasana and they’re straight in Tittibhasana. That’s all folks. 1. Stretch your hamstrings. The hamstrings are contracting in Bakasana, but they’re stretching in Tittibhasana. This means your students need plenty of hamstring preparations in the sequence that you create. 2. Stretch and contract your adductor muscles. Tittibhasana requires you to stretch the adductors since the legs open at a slight angle when you straighten the knees in this pose. At the same time, the pose requires you to engage your adductors so that your legs don’t slide down your arms. To facilitate this, your sequencing needs to include both adductor opening and strengthening. 3. Engage your core (even more). If your hamstrings and adductors are the least bit tight, they will pull the weight of your body down as soon as you start straightening your legs. To counteract this downward pull, you have to fire up your core and create even greater lift than you do in Bakasana. 4. Engage your quads: Engaging your quads straightens your knees in Tittibhasana (Firefly Pose). Your quads also work with your core to flex your hips and support the weight of your pelvis. Your sequence and your verbal cueing should include postures that help your students tune into these muscles so they know how to engage them once it’s time for Tittibhasana. 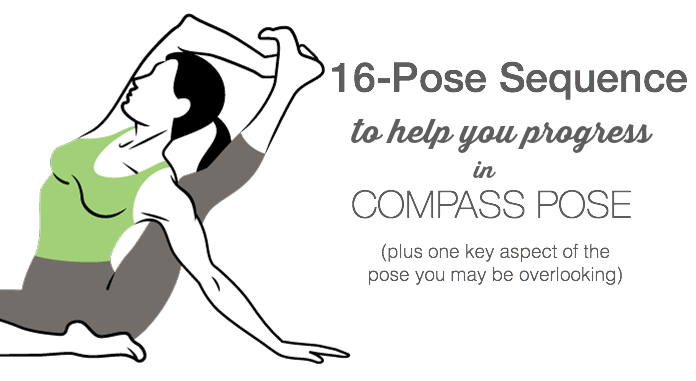 Practice the 16-pose sequence above and notice how all of these layers are incorporated. Let me know how it goes in the comment section below! When you understand the nuances of postures like Bakasana and Tittibhasana, you can help demystify these poses for your students. Even more, you can create logical, effective sequences that keep your classes fresh and help your students do more than they ever thought they could. Developing effective sequencing for all levels, including more advanced postures like these arm balances is one of the pillars of my Teacher Training Programs. I offer my 500-hour Advanced Certification in San Francisco, London, and Hong Kong. If you want to deepen your practice, advance your teaching, and learn to create more effective sequencing, please join me! In order to prepare your body for Vasisthasana, you need to open your hamstrings, adductors (inner leg muscles) and outer-hips. It’s also a good idea to awaken your core and learn how to work your shoulders safely in the posture. Poses 1-2: Honestly, I love to start practice on my back—especially when I’m going to tackle demanding postures later on. Supta Padangusthasana is the perfect way to settle in, slow down, and open the hamstrings and adductors.